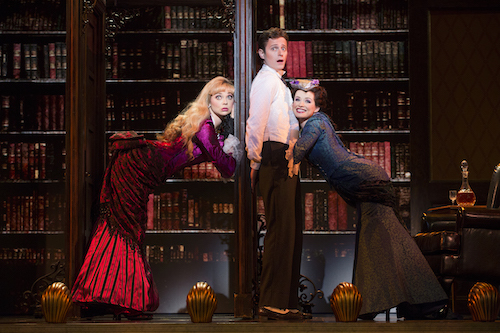 A Gentleman’s Guide To Love & Murder, the winner of the Tony Award for Best Musical in 2014, finished its Broadway run earlier this year and embarked on a tour across North America. It’s currently making a stop in Toronto at the Princess of Wales Theatre. Unfortunately, this off-kilter class struggle/revenge fantasy musical comedy failed to charm me. The deliciously dark plot sounds promising. The only thing standing between Monty D’Ysquith Navarro (Kevin Massey) and his large inheritance is eight family members in the line of succession (all played by John Rapson). So Monty devises a scheme to murder his way to the fortune by picking off his relatives one-by-one. Throw in a love triangle between Monty, his cousin/fiancée Phoebe (Adrienne Eller) and his mistress Sibella (Kristen Beth Williams) for good measure and we’re off to the races. I fully acknowledge that I am probably not the target audience for this show. A Gentleman’s Guide To Love & Murder is supposedly a fun, frivolous comedy but I found it to be a tedious exercise in bland, WASPy humour. At times I thought it was cute but rarely actually funny and not at all clever or original. First, let’s start with Steven Lutvak’s largely forgettable score (I’m actually struggling to recall any of the songs) which features utilitarian melodies and lyrics which I thought struggled to be clever but rarely succeeded. Now, let’s move on to Robert L. Freedman’s book which I found hackneyed. Even if you’re willing to overlook the cringe-worthy character who is a mincing gay cliché and the culturally insensitive travel montage, in one scene Freedman employs the most literal use of Chekhov’s gun I’ve seen and the script also includes a drawn-out and often irritating love triangle that almost felt like a deliberate thumbing of the nose to the Bechdel test. While the show is intended to have a distinctly old-timey feel and is likely supposed to be an homage to classic musicals and British farces I’m at a loss to think of another contemporary musical that feels so dated. Frankly, I find it hard to believe this show played on Broadway at the same time as shows like Fun Home and Hamilton. To be fair, the aforementioned, irritating love triangle does culminate in one of the more amusing numbers in the show, I’ve Decided to Marry You, in which Phoebe and Sibella are in adjacent rooms and Monty desperately tries to keep each woman unaware of the other. Credit to director Darko Tresnjak for his clever staging concept and timing for this scene. Much of the rest of the show’s comedy relies on a single actor who plays all of the ill-fated D’Ysquith family members. John Rapson does a commendable job in the marathon performance however, I did find that the overblown, campy delivery style he uses to get laughs renders all of his characters more alike than they are different. Maybe I was a bit tired going into the show, maybe this show just doesn’t mesh with my sensibilities and if it sounds like something that might appeal to you, you may find it enjoyable. Admittedly many in the opening night audience seemed to genuinely find the show entertaining. However, I found A Gentleman’s Guide To Love & Murder to be a bit of a bore and left a bit puzzled as to how it has done so well. I really liked the shallow campy humor, but was in the mood for it. I think you’re right in that the score didn’t have a single standout song. I also thought the songs really hard to follow. I saw a lot of seniors turn their hearing aids up to try and catch the lyrics. I think it’s done so well because it is one of the few big productions to not be a revival, a stage version of a recent movie, or a musical based on the life of a rock group or Marvel super hero.